The Austral Examiner was a short-lived weekly newspaper, established particularly to oppose state aid to religion. The newspaper's prospectus stated, 'The grand distinctive feature of the Examiner will be this:- It will invariably recognise the paramount claims of religion as the highest human interest. 'The originator was an experienced English journalist William Whitridge, in partnership with Andrew Garran (later editor of the Sydney Morning Herald), and with Dr Edward Davy as editor and George Dehane was the printer. 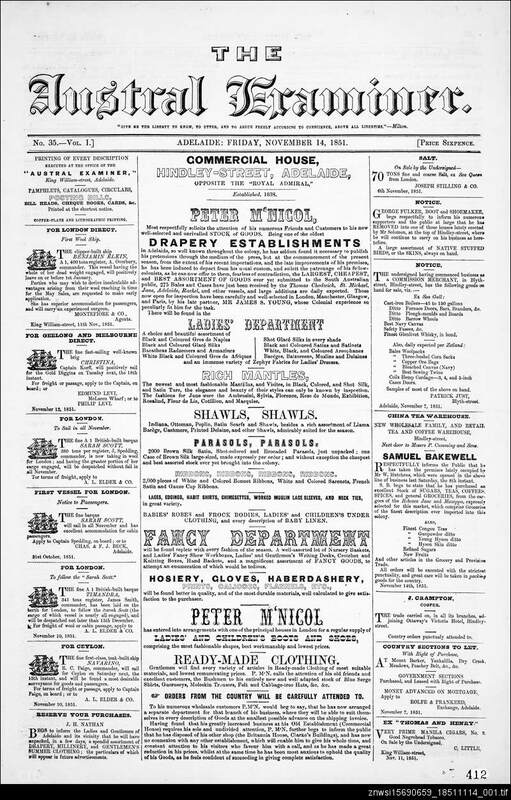 The Austral Examiner commenced at the time of the election of South Australia's first Legislative Council. An early and very controversial debate in the fledgling South Australian parliament concerned the separation of church and state. The Austral Examiner was in favour of complete separation of the two, and particularly represented the views of members of the Non-Conformist churches in Adelaide. In opposition, the Adelaide Morning Chronicle, under Andrew Murray, represented the more conservative viewpoint of a group of Anglican pastoralists who supported state aid to religion. The Austral Examiner included in its pages details about the building of new churches in the colony, and other religious activities, as well as general news. The economic downturn of 1841 brought the closure of the newspaper, and Whitridge, like many other Adelaide men, took up farming as an alternative to city business life. The Examiner was nominally incorporated into George Dehane's Odd Fellows' Magazine, and Whitridge returned form his brief stint as a farmer to share the editorship with Dehane, before he moved onto join the Register staff and rise to editor of that newspaper. Whitridge died in 1861 at the age of 36, of tuberculosis. Two of his sons became well-known journalists with the Register.